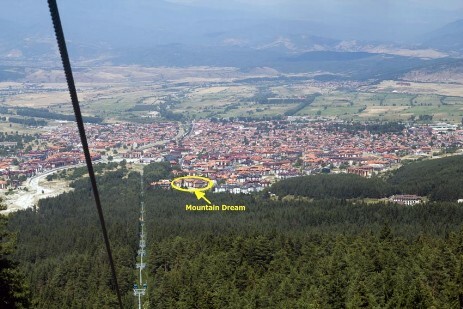 Mountain Dream is situated above the town just off the road (Pirin Street) leading up the mountain. About one kilometre up from the bottom gondola station take the left turn just as the road bears left and under the gondola. Mountain Dream is signposted and is about 100m up the road. 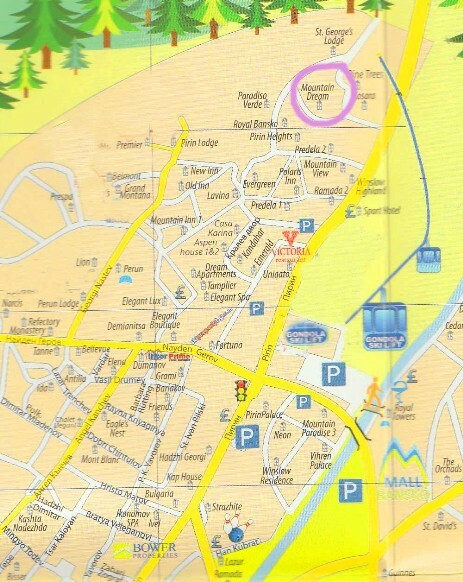 If the entrance at the bottom is closed, turn right and enter the complex via the hotel entrance. Turn left and go down the drive. The security office in the ground floor of the building on your right. The entrance opens out onto the drive. Arriving by car you will come in from the Razlog road. When you reach Bansko bear right just before the river and follow this road parallel to the river and then across the river to traffic lights. Turn right. If you are arriving by bus, alight at the bus station and take a taxi to Mountain Dream. Check the price per kilometre displayed on the window (the top line day/night) for a guide to the cost. The total journey is around 3 kilometres.